As fast as she could, Tierney tore the wrapping paper on the front of the tall package to reveal a plastic handle attached to the box with the words, Pull This, written nearby. 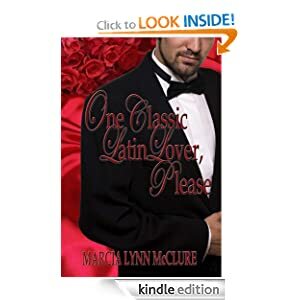 Pulling on the handle, Tierney gasped as the front of the box broke away to reveal Alec’s gift—one classic Latin lover! There inside the large box stood a man—not a cardboard cutout man but a real man. And, oh, what a man it was! Tierney’s mouth hung agape as she studied the man standing in the box. He was literally tall, dark, and incredibly, incredibly handsome! Dressed in a high-end white shirt, black tuxedo, and black bow tie, the man owned black, loosely swept back, Antonio Banderas hair that gave him both the short-cropped look of a refined gentleman and yet the “just raked my fingers through my hair” appearance of a man who could seduce a woman with simply a smile. His short, dark whisker growth was perfectly manicured—a goatee and mustache, with a not-too-thin and not-too thick beard line that followed his perfect square jaw from his goateed chin to his side burns. His eyes were dark and smoldering—the perfect complement to his Latin complexion. His cheekbones were set high, and his nose was as straight a nose as Tierney had ever seen. Broad shoulders, long legs—the man was gorgeous! I have read most, if not all of Marcia Lynn McClure’s books. I consider myself a fan – I really don’t think anyone writes kissing scenes as well as she does. I’ve come to know her style and what to expect when I pick up one of her books. That said, I was unfortunately left unsatisfied with this short novel. It had all of the right elements – a sweet, innocent heroine; a gorgeous hunk of a man (with the required shirtless scene); along with all the quirky MLM things we know and love. So, it wasn’t that anything was “missing” per say, but what she added that I didn’t care for. First, the good stuff: It comes with “Chimney Sweep Charm” at the end of the e-book and the paperback. So, you get two novellas for the price. Once Classic Latin Lover, Please started off great. I loved Tierney’s obsession with “classic Latin lovers” and the fun and supportive relationship that she had with her brother Alec. The stressful relationship between her and her parents because of her mom’s societal expectations was a good way to add depth to Tierney’s character. Her fickle friends were stereotypical, but that was totally appropriate for family’s societal status. The bridal shower was amazing! Who wouldn’t want to have a brother like Alec, who sent his little sister a real, true to life, classic Latin lover? A brother who cared enough about his little sister to go to such extremes to prevent her from making the biggest mistake of her life? LOVE THAT! Unfortunately, once Tierney left California and headed to Washington to be with her brother Alec, plot holes showed up along with other distractions that left me with an over-all dissatisfaction with the book. Case in point: when Tierney attends Rome’s family Halloween party (which was AMAZING by the way), Heidi rushes in and makes a big deal about ANOTHER person walking into a plane propeller and Alec comments that it had happened the year before. Enough time is spent on the topic that, as a reader, I thought it was important and would somehow tie into the plot. Nope. It was really never mentioned again and was just a distraction to me, because I kept waiting to see how that would get tied in. Then there’s the whole to-do about Heidi and how Rome thinks that Alec has a crush on her when Tierney first arrives. In actuality he really likes Rome’s sister Celeste and Rome seems to know this and then schemes with Tierney to get Alec & Celeste together with no further mention of the supposed crush on Heidi. Probably my biggest complaint, however is that the bulk of it read like a psychological case study instead of a sweet romance. There was so much “psychobabble” going on that I thought I was reading a different author. Perhaps MLM was thinking she was adding depth to her characters and storyline, but it was just plain annoying to me. Like I said, I’ve read a lot of MLM’s books and I know what to expect from her – this was like an ugly step-sister or something. There are enough of her trademark elements (and those are sooo well done) that it masqueraded as a sweet MLM story, but underneath it was something else entirely.